GOP Senate candidate Monica Wehby with a supporter in Lake Oswego, Oregon. A mother of four is running for U.S. Senate. Polls show her well ahead. Then, just days before the primary election, allegations surface that she stalked her ex-boyfriend and harassed her ex-husband. Her campaign implodes. That would probably be the story in almost every other state, but Monica Wehby, a Republican, is running in Oregon. The implosion may not happen, thanks to a distinctive characteristic of the state’s elections: They’re conducted by mail, and because Tuesday is the deadline, many people have probably already sent in their ballots. Republicans thought they had found the right candidate in Wehby, a pediatric neurosurgeon, to take on Democratic Sen. Jeff Merkley in November. The few polls that have tested the GOP primary in Oregon showed Wehby leading by about 20 percentage points — far ahead of her closest competition, state Rep. Jason Conger, the only Republican in a field of five to have held elected office. But there’s a reason why studies show that elected officials tend to be better candidates. They are often better vetted. In the past week, a 2007 police report came to light showing that Wehby’s ex-husband accused her of slapping him with a pad of paper during a verbal dispute (she denied touching him with the pad, according to the report). A few days before that, Politico revealed that in a 2013 police report, Wehby’s ex-boyfriend accused her of stalking him. She was not arrested in either incident. So, Wehby’s chances of winning have nose-dived, right? Probably not. Oregon votes over a 16-day period. The state sends ballots to every registered voter, and so far, 25 percent of those voters have returned ballots. We don’t know how many people will eventually vote, so we can’t say for sure what share of the vote is left to be cast. 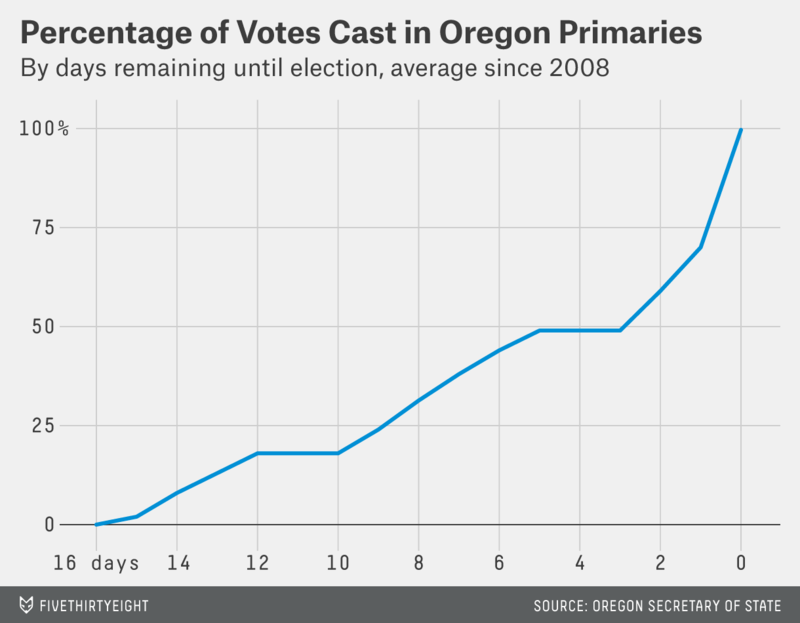 But we can get a sense by looking at the past three statewide primaries in Oregon. The stalking accusations hit the news May 16. At a comparable point in the 2008, 2010 and 2012 primaries, an average of about 50 percent of ballots had been returned. If Wehby were up by 20 percentage points in those ballots, Conger would have to win the remaining ballots by a little over 20 points. That’ll be tough. The allegations would have to change a lot of minds very quickly. The harassment allegations were made public Monday. In the past three statewide GOP primaries, less than a third (30 percent) of ballots were returned on the final day of voting. If Wehby won ballots returned before Tuesday by 20 percentage points, Conger would need to win ballots cast in the final 24 hours by more than 35 points. That’s even tougher.